Last of the Summer Levellers.. 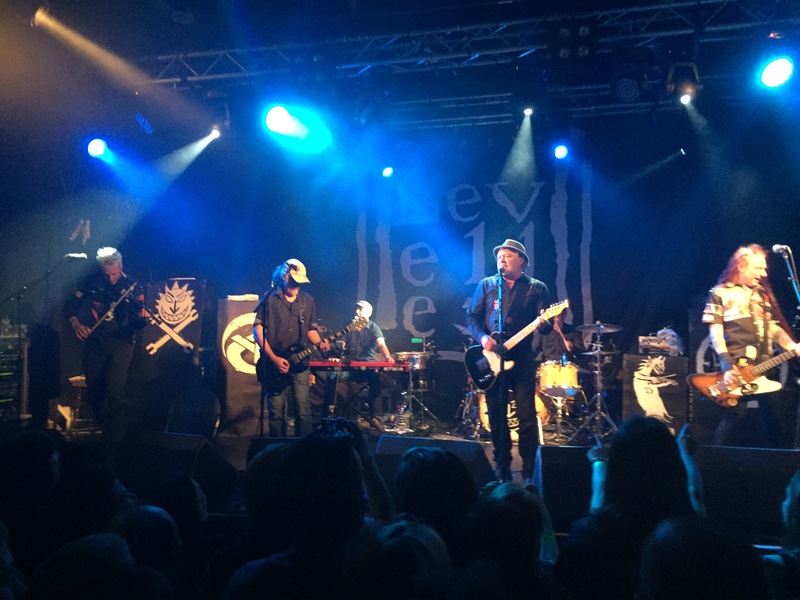 The Levellers are my first musical love, and you supposedly never really get over first loves – so it’s odd I’d almost forgotten that I’d got a ticket for tonight’s gig in Holmfirth until Tim reminded me at Deerstock over the weekend. As such I’d managed to not book today off work, nor book anywhere to stay, or basically do anything sensible at all except wangle working in our Leeds office the day before for a shorter schlep down to the gig. Since I’ve exponentially grown my gig-going the Levs don’t make up quite such a big proportion of my musical life these days. However, t’was exciting nonetheless. Driving through the stunning Yorkshire countryside down to Holmfirth – famous as the location for Last of the Summer Wine – was lovely in the sunshine, less so in the early hours on the way home with a 20mph-slower-than-the-speed-limit numpty in front of me and a full-beam-wanker behind me… but anyway, that’s a moan for another day! Holmfirth is a lovely picturesque place, at the Picturedrome is a cracking venue comprising of a former cinema with the seats removed and a couple of balconies. Outside at the nearby Old Bridge I found a partial mini Deerstock reunion in the form of Tim, Tina and Kev – alas no Simon or Snotty (who has elected rather than to summarise Deestock in detail on her blog start a campaign of making lots of people get dust in their eye. In fact, on the subject of Snotty you should check out her photos from Deerstock too – in numerous and edited form). But there were plenty of other familiar faces milling around. Not least much of the band and Gaz Brookfield enjoying a few pre-gig drinks before heading off the soundcheck. Deer, stock and (mead) barrel..
Ah, so that was Deerstock. Now I’m home, the tent is dried and back in the bag (subject to repairs later), I’m showered and the washing machine is on probably the most daunting task of the day is how on earth to go about summing up four days and nights of mayhem in a field in Newton? Deerstock 2014 was definitely the highlight of my year last year, and this year might well have just gone and topped even that. So I will apologise in advance for the wordiness, and for the inevitable blanks in my recall… this is going to be a loooooong post. Off work on Thursday I was mooching around planning on arriving on the site around 4pm – upon messaging Tim around lunchtime he revealed that he and Tina had already set up camp – so rather than pace around the house I hopped straight in the car and made my way to Newton via the supermarket for last minute supplies. Tina and Tim had done a great job in saving a chunk of space to keep us all together – and I was soon pitched and sorted in time to help Lisa and Pixie get their tent up. Once cabin fever relieves you get that slight craziness and the concoctions came out perhaps a little earlier than planned. As we got steadily more pickled by the fire we had the chance to marvel at how quickly Spike can put up his gigantic tent, and see our village slowly constructing itself around us. A ramshackle and wonderful mixture of camper vans and tents nestled together containing many of my favourite people – sure, there wasn’t any music on, but that wasn’t really needed. I talked about my reservations over Splendour as an event before – a little too sterile, a bit too rule-bound, and it didn’t bode well when arriving at the site as it opened to see loads of people having assorted things confiscated. In defence of the security guys, they were very courteous and I thought the organisers had done a decent job in communicating what would and wouldn’t be permitted on the site – but well, taking a lads water off him because he’d had a swig on the way to the park? A bit much! After the state I got in three years ago I didn’t attempt any smuggling of contraband this year – more’s the pity as I wasn’t so much as patted down on my way through the gate! It’s probably a good thing though! Early on to the site my first objective was something to eat, which was duly purloined from the bacon cob van – shortly after this I bumped into Ian and Lucy for a quick chat over our assorted food choices. They’d hit the bar already, which was my next stop. Ah, beer tokens. I loathe them – but grudgingly bought some in order to get that all important first cider of the day. You can see why they don’t want people bringing their own booze in when they’re charging £4 a pint for their own edited range of beverages. That said, ales, lager, cider, jägerbombs and Pimm’s were all on offer in exchange for a magic token. After picking up a drink I wandered down to the Confetti Stage where Georgie and her band were getting set up. The Splendour of the weekend to come..
Whilst I’ve been still basking a bit in the warm fuzziness of last weekend at Wistful, it will be good to get a bit of full-on Ferocious Dog this weekend at Nottingham’s Splendour Festival. 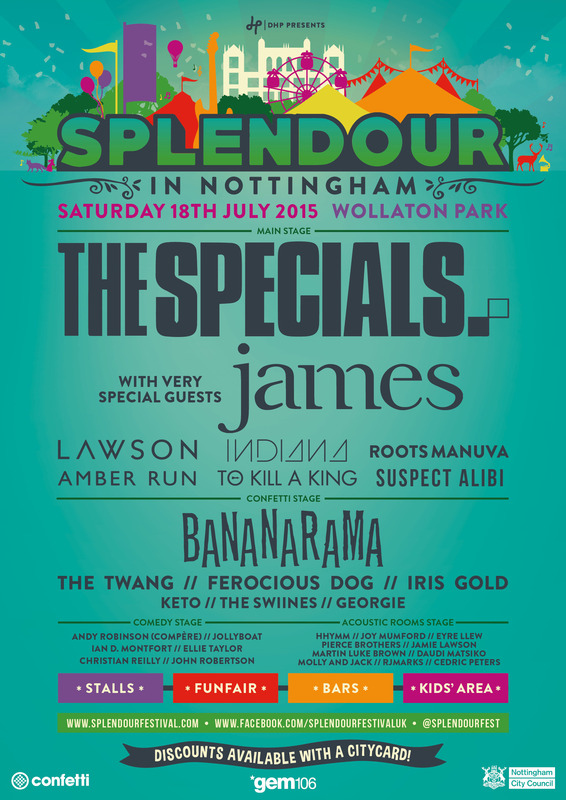 I’m not generally a huge fan of Splendour, it’s pretty pricey (although I guess if you divide the ticket price by the number of acts you want to see it does work out good value this year). FD played it last year but an early slot on a small stage so I didn’t indulge, although I did go to it when the Levellers played a couple of years back. The list of terms and conditions are potentially entertaining too depending on how many Hell Hounds descend for the 5:15 showtime. We shall see! Definitely this year I won’t be attempting to smuggle in a litre and a half of rum (successfully) like I did on my previous visit… after consuming that I found myself practically asleep against the crash barrier for much of the Levellers set. Mercifully this rendered me unable to ‘appreciate’ the headline act of Dizzee Rascal too so perhaps it wasn’t such a bad plan! This year though with Roots Manuva, The Specials and James on the bill too there’s more to look forward to than just Ferocious Dog which is always a bonus, and there’s sure to be new acts to discover. 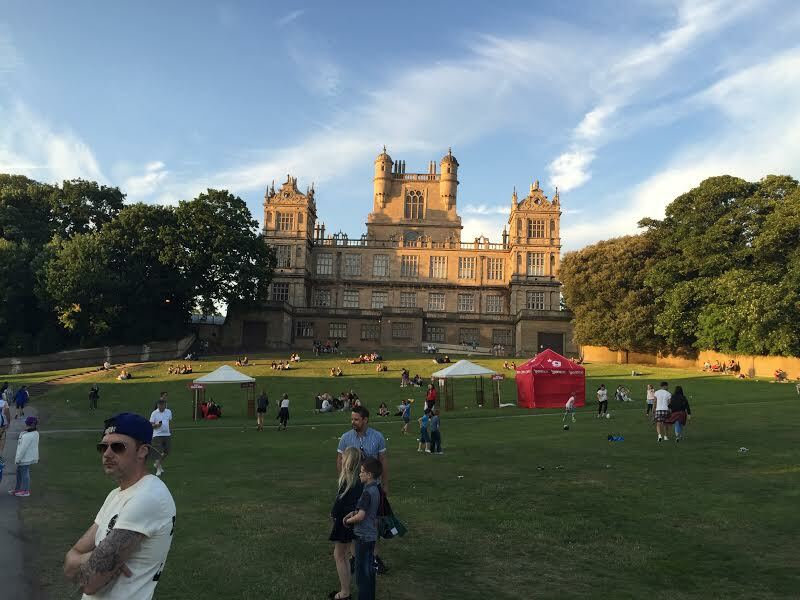 The other drawback to Splendour is the lack of camping option – on account of the potentially vicious deer in the park – although whilst not my current home Nottingham is a place I can find places to stay pretty easily – and I’m sure there’ll be a few folk out and about to make it into a suitably fun party! 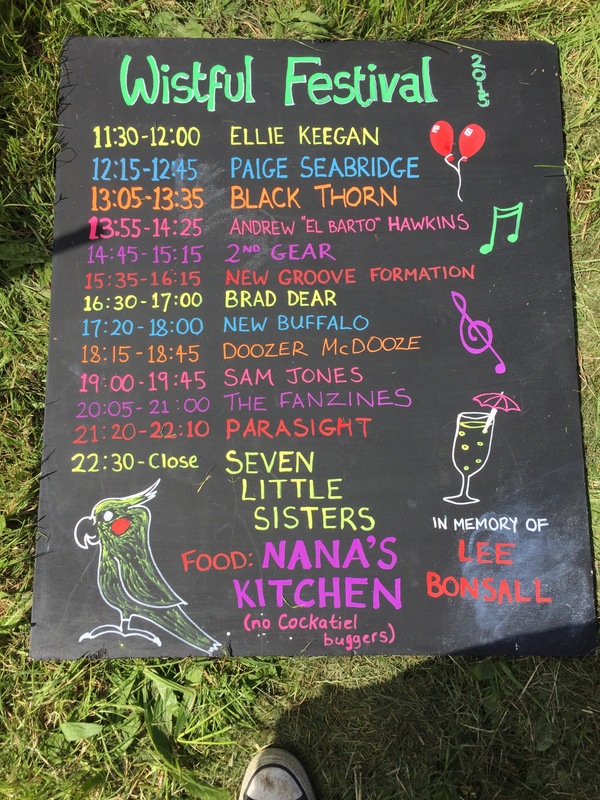 Even with Ferocious Dog partying in a park this weekend in Galhampton, it was always going to be to Derbyshire near Matlock Bath that I’d be heading this weekend for Wistful Festival, organised by my lovely friend Lisa to raise money and awareness for the Lee Bonsall Memorial Fund. An expansion of the day event she put on last year, and this time on a lovely spot of farmland with a campsite built in. A debut outing for my new tent, and an excuse to raise hell whilst raising money – what’s not to like? Amnesia is because, well, I might have a little bit of difficulty in bringing to mind everything that happened, which is where Snotface’s blog might help to fill in a few gaps – although she’s got loads of photos to get through before that’s likely to happen. Sometimes there’s a benefit to simply taking a grainy picture on your phone for blogging purposes rather than taking hundreds of (mostly) lovely shots on a proper camera! You can’t possibly do justice to a couple of days in words, so apologies in advance to any events or people missing from my musings. 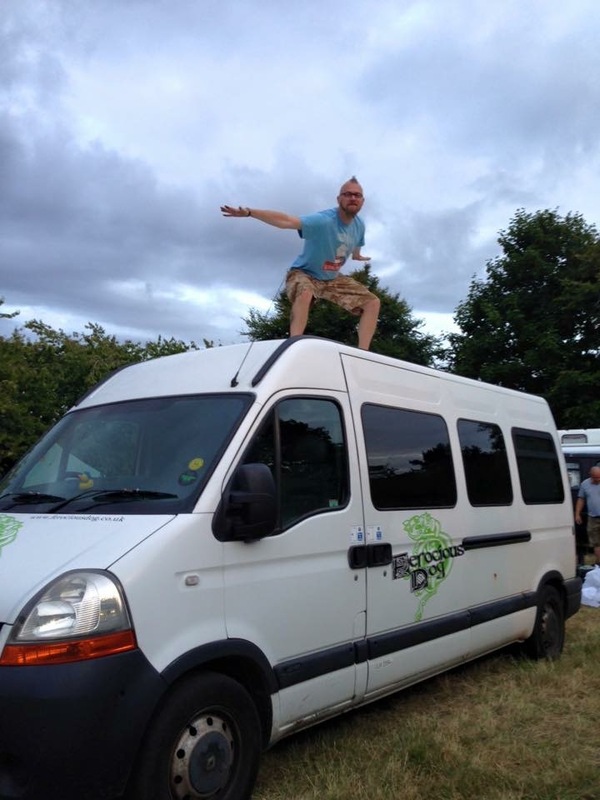 Anyway, I arrived on the campsite early on Friday – the festival wasn’t occurring until the day after, but I had the day off, and what better thing to do is spend an extra day in a field with your friends, plus if there were any last minute bits of help needed then I’d be about. Luckily there wasn’t beyond writing up the acts on a blackboard (with a few errors), supervising Paul’s barbecue and well, starting on the cider probably a little earlier than is officially recommended once the tent was up. Warsop is a place I’ve become more familiar with than I was (which was not at all) before Ferocious Dog entered my life. It’s a really nice north Nottinghamshire village – that would’ve been developed to support the colliery sunk there and obviously subsequently closed. The carnival there is one of many years standing and held on the first or second sunday of July, on The Carrs, nestled between Market and Church Warsop. It’s a cracking community day out in its own right – although of course there was the obvious lure for me of a certain band closing it off in their three piece acoustic guise. Upon parking up in the middle of Warsop I wandered over just ahead of the procession to find the field set up with an assortment of stalls, a funfair and a central arena, with the music stage in the far corner of the field. With events like jousting and falconry on offer as well as music there was plenty to entertain. I bumped into Ken who was talking with a chap from Warsop Remembers, an organisation that he’d painted a picture for that might potentially end up as a raffle prize to raise money for the cause – so look out for that for a bit of unique Ferocious Dog related memorabilia. However, it was the music that was my main motivation for going – so I soon found myself settled in front of the stage where Ellie Keegan was up first. I’ve seen Ellie play a few times now and she’s a cracking performer – although not to my knowledge with the addition of a loop pedal (remember spare batteries next time!). 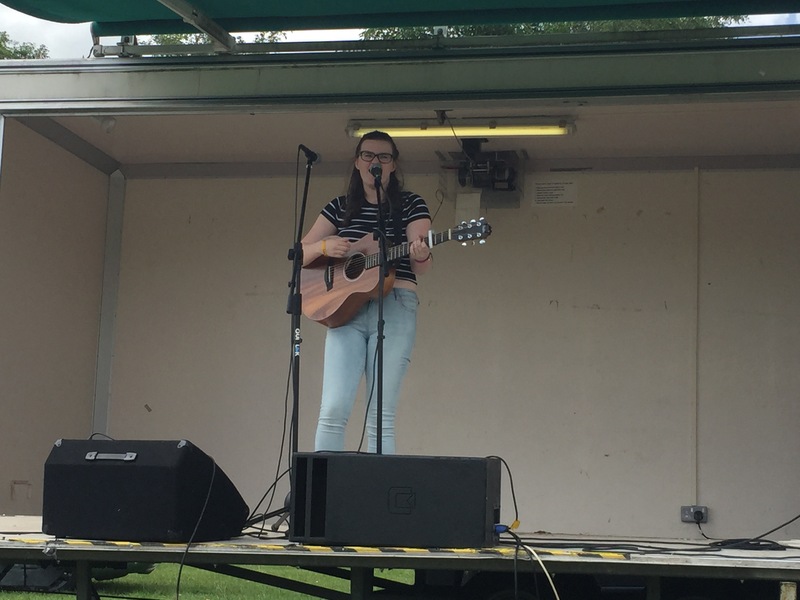 She played a mixture of covers and a couple of original ones – with things ranging from Crazy by Gnarls Barclay, a mash-up of Come Together by the Beatles and Lose Yourself by Eminem (I think – that’s not my genre!) with plenty of use of the loop pedal on both guitar and vocal layers. A diversion away from my normal subject matter again, but a good one – and kinda FD-related. For my day job I do quite a bit of driving, which can be a bind but also a great opportunity to absorb music, and this week the postman was especially kind to me this week delivering new albums from both The Outlines and Funke and the Two Tone Baby (the latter of which I forgot that I’d backed as part of a crowdfunding campaign a while ago – so that was a great surprise!). 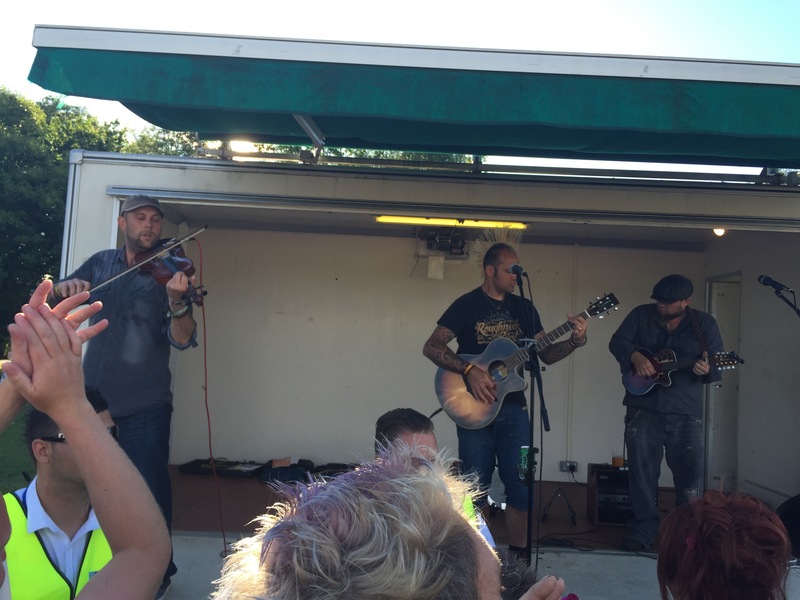 Both acts are probably familiar to most folk reading a Ferocious Dog themed blog – Funke has shared events with them a number of times, including DogFest and indeed Something to Smile About last month. To my eternal shame whenever I’ve been at events he’s played I’ve either found myself missing it due to getting food (DogFest) or being under extreme influence of alcohol and not really taking it in (Something to Smile About) – only to find my friends absolutely raving about him. So come Deerstock I fully intend to be in a fit state to appreciate his performance. I’m making no promises though, there’s strange fruit and other goodies at that particular festival! As for The Outlines, well they are fronted by none other than Kyle Peters who was guitarist and vocalist for one song for Ferocious Dog until recently – now along with Martyn Brown on Bass and Dean Hill on drums they are producing some rather awesome punk rock tuneage. I’ve yet to catch them live, I’m looking forward to doing so soon though! 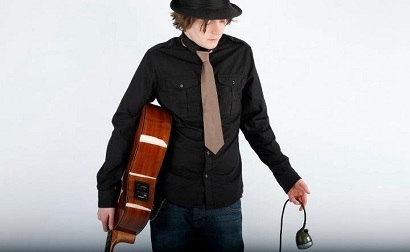 I’m sure most of you will have spotted on Facebook that Dan has revealed the forthcoming album cover as we’re looking at a slight delay to the release date. It features two sinisterly feature-limited and thus dehumanised police officers restraining a person – rather roughly judging by the blood splatter on the floor, with a third standing behind smiling at one of his companions. 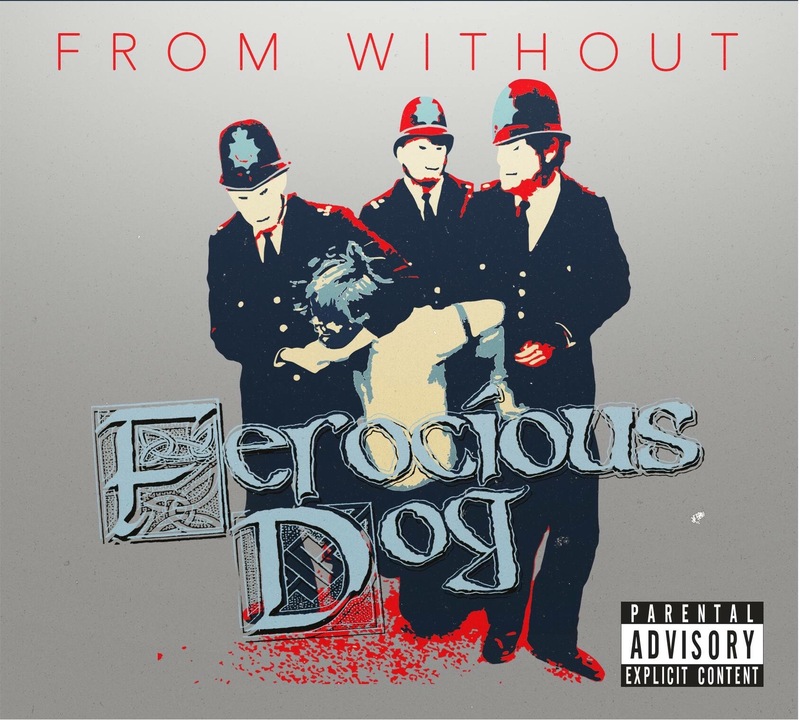 Those of you who’ve had a chance to absorb some of the new songs at gigs (or had a listen to some of the unmastered recordings) will have already attuned to the underlying disquiet either at specific events or the current political climate – which all hooks into the album title From Without too – the first album just bore the Ferocious Dog logo (and indeed name), whereas now we’re seeing something that draws together the themes from the songs and gives it accompanying imagery and a name, a consistent message. Glaston-buried, but the fun doesn’t end.. 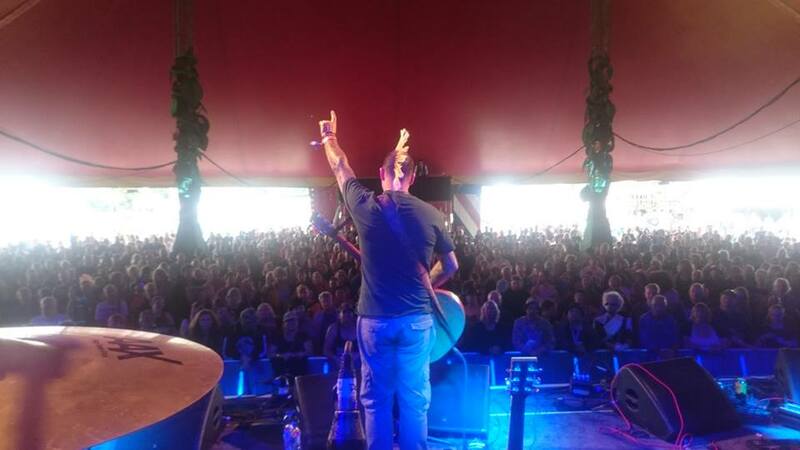 I think it’s fair to say that Ferocious Dog‘s debut at Glastonbury has been a resounding success – just look at this photo I pinched from Scott! Certainly the number of search engine hits to this site searching for more information about them has increased since Monday. The cherry-on-the-cake of some BBC coverage of course never transpired, but with folk uploading photos and videos to Facebook we did at least catch a glimpse of the performance, to the third biggest Avalon crowd of the weekend. Fantastic. (special shout out to Colin who was uploading stuff as it was happening).